Force India will be known as Racing Point Force India starting with the Belgian Grand Prix this weekend following the acquisition of the Force India Formula One Team by Racing Point UK Limited. The new ownership was finalised on Thursday 16th of August with a consortium of investors led by Lawrence Stroll agreeing terms to secure the future of the team. Racing Point UK Limited has appointed Otmar Szafnauer as Team Principal and CEO with immediate effect. Szafnauer has been with Force India since 2010 as Chief Operating Officer and has played a pivotal role in the team’s progress up the grid. The Fédération Internationale de l'Automobile (FIA), has today, 23 August, accepted the mid-season entry of Racing Point Force India with immediate effect to the FIA Formula One World Championship in accordance with Articles 8.1 and 8.2 of the 2018 Formula One Sporting Regulations. This means the team will race this weekend at the Belgian Grand Prix. Since the Force India Formula One Team Limited was placed into administration on 27 July, the FIA has worked in collaboration with the Joint Administrators (Geoff Rowley and Jason Baker of FRP Advisory LLP), Racing Point UK Limited and Formula One Management to ensure the expedient and compliant transition of the team’s assets to the new entrant. This successful process has protected motor sport competition at the highest level, as well as the jobs of over 400 employees. Following a disciplinary investigation and prosecution by the FIA under Article 4 of the FIA’s Judicial and Disciplinary Rules, the Sahara Force India F1 Team has accepted its exclusion from the 2018 FIA Formula One World Championship with immediate effect, due to its incapacity to comply with Article 8.2 of the Sporting Regulations moving forward, and forfeits all Constructors Championship points under Article 6.2. 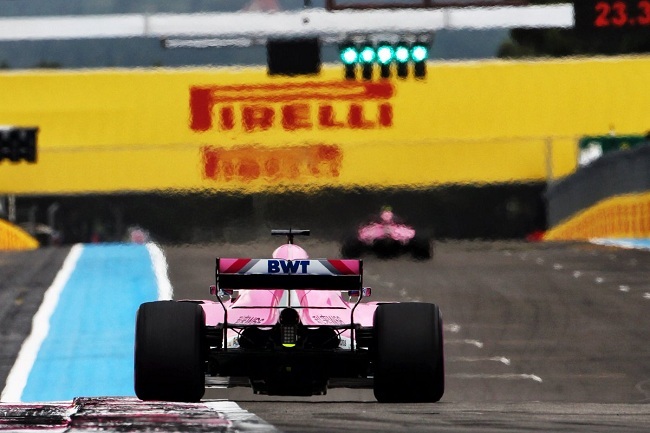 The Joint Administrators of Force India Formula One Team Limited have completed the sale of the business and its assets to Racing Point UK Limited, the investment consortium led by Lawrence Stroll and the team’s senior management. Formula 1 Chairman and CEO Chase Carey said: "We are very pleased that the situation around Racing Point Force India has been resolved and that the team will continue to race in Formula 1. It is also very gratifying that in partnership with the stakeholders involved we have been able to safeguard the livelihoods of the many hundreds of people working at its Silverstone base. It's enormously important that we have a full grid of competitive, capable teams in Formula 1 and we are confident that Racing Point Force India will go from strength to strength in the future." Racing Point Force India today welcomed the FIA’s decision, which enables the team to race this weekend at the Belgian Grand Prix.